I am very pleased to announce that the winner of 4th annual game giveaway is: Suzan from the Netherlands! 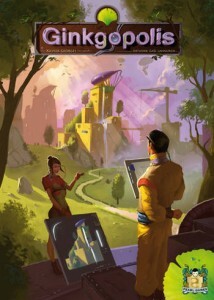 Congratulations to Suzan who will soon receive the copy of Xavier Georges’ Ginkgopolis by Z-Man Games. If you want to see the answers to the quiz, these are now on the competition page. Commiserations to all the other entrants who did not win. The competition may have finished, but I have some exciting news of a new competition coming in the next week or two, so stay tuned. In the meantime, reviews of the latest Spiel releases will begin in the next day or two. WIN GINKGOPOLIS in the 4th Annual Game Giveaway! I am very pleased to announce that I am holding my 4th annual game giveaway where I give away one of the new releases from Spiel 2012 which starts in just 5 days time. 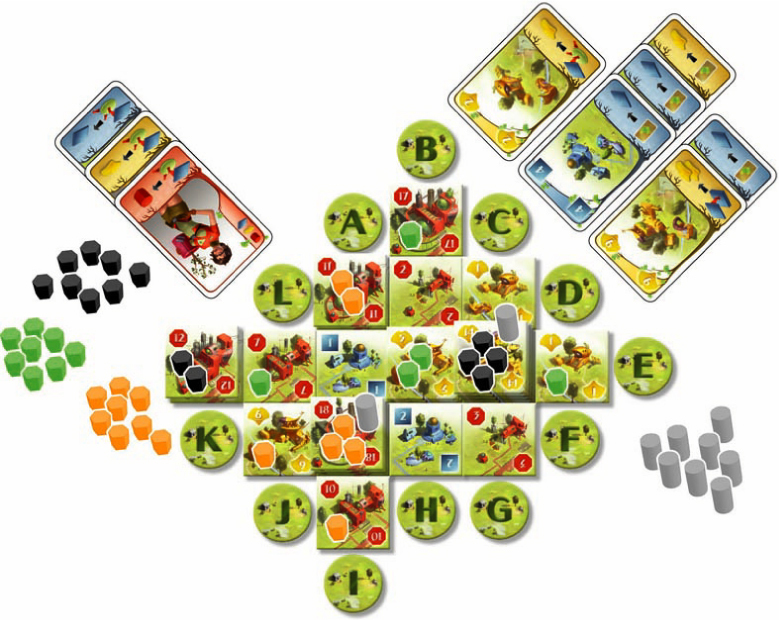 This year you can win a copy of Ginkgopolis by Xavier Georges (Carson City, Royal Palace, Troyes and Tournay) kindly provided by Z-Man Games. Visit the competition page for more details on how to enter, and good luck. Xavier Georges is one of the designers I really like and it’s good to see he has a new game this year called Ginkgopolis. 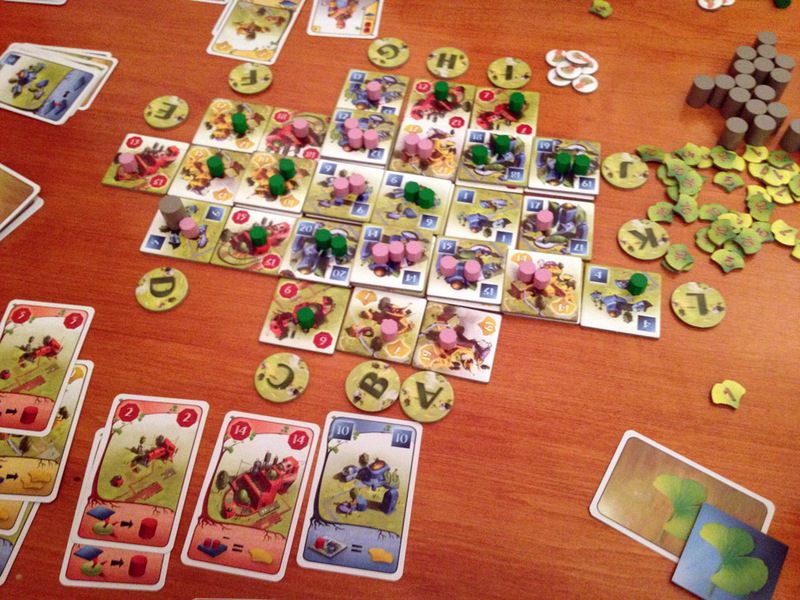 Carson City, Royal Palace, Troyes and Tournay. Ginkgopolis is a game of futuristic city building. 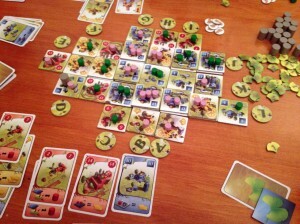 On their turn, players simultaneously select a card from the 4 cards in their hand. At the end of each round, they will then pass the remaining 3 cards to their neighbour who adds one new card to make a total of 4, and they will select from those on their next turn. That sounds like an interesting card mechanic – sort of like 7 Wonders but continual. Playing a card on its own gains the player resources (their own markers), tiles or VPs (determined by their colour). The amount is based on the height of the matching building (plus bonuses based on items you already gained). If the player plays a building tile with their card, they place the new tile where the matching letter is (moving the letter outwards) plus gain any bonuses based on items already gained too. The player places one of their resources (markers) on the building to show their ownership (but this can change during the game). The card matching the new building is added to the draw deck too.